Most of use tend take screenshots of stuff on the desktop screen and save it for future reference. Besides, we also capture and save screenshots of websites or webpages for easy sharing and reference. We have see number of tools to perform simple task of screenshot and website capture on Windows powered PCs. 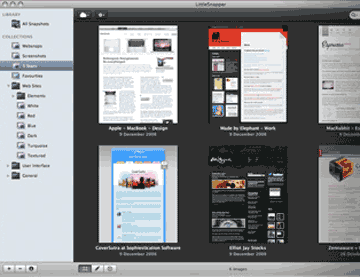 Following are useful applications for Max OSX systems. 1. 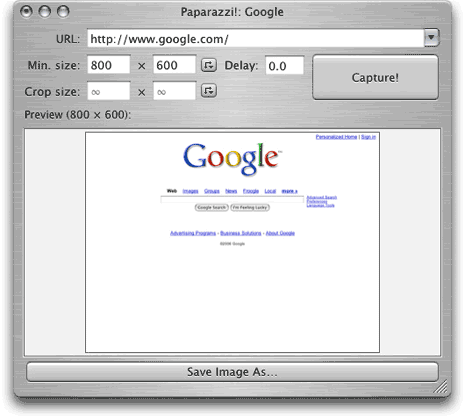 Paparazzi for website screenshots – It is very easy and small application to take screenshots of any webpage or website. Just enter the website URL, select minimum screenshot size and crop size. Click the Capture button, see the live preview and save the screenshot on your computer. It is a quick and basic application with neat interface. 2. InstantShot for screen capture – While you can use above tool ‘Paparazzi’ for website capture, InstantShot comes handy in capturing full or part of desktop screen. You can set timer to capture screenshot and use it to take full or portion of screen capture. 3. Little Snapper for website & desktop capture – This cool tool does both website and desktop screen capture with ease. It has loads of features and comes with usual Mac glitz and gloss. Besides screenshot capture, it has image editing featuring like adding text, callouts, highlight, blur etc. You can even send your screenshots directly to Flickr account or FTP screenshot images. It has both free and paid version available for download. Beside above, there are number of online alternative to capture screenshots like: SuperScreenshot, Aviary addon and Fireshot addon. Which tool do you use to capture website or desktop screenshots on your MAC beauty? As for me, I prefer to use ScreenshotsShots Remote. It allows to take screenshots of your monitor remotely. So you can see what is done on your computer. I found a program to take screenshots on Mac! It is called Screenshots Remote. There is also a tutorial about this program on youtube. It can take screenshots itself or even remotely.I liked it. I agree with Greg. I used Skitch and Little Snapper before trying Voila. I was quite happy with LS until I won a promocode of Voila. Skeptical at first, Voila overwhelmed me. It is features are a lot more advanced than Little Snapper, although can’t say much about the UI. But that doesnt matter as long it performs its functions well. The uploading features are simple and fast. I highly recommend to anyone who does a lot of screen capturing and annotating.